Staats Cotsworth had the lead in CBS Radio's Casey, Crime Photographer. 03/18/1974 0058 Sea of Troubles A trans-Atlantic voyage on a ship is also the scene of a murder conspiracy where a man enlists the help of his brother to kill his wife for her wealth. 06/13/1974 0105 The House of the Seven Gables A fresh take on Nathaniel Hawthorne's classic tale of tragedy shadowing the lives of the manor residents, and the curse visited upon them. 08/20/1974 0136 A Preview of Death A young woman and her husband own a resort that has a working cable car. Her brother, an upright engineer suspects that the cable might not be safe. He then dreams of a beautiful girl perishing in a cable car crash. 01/10/1975 0201 The Masque of the Red Death This is a modern day adaptation of Poe's classic. Here, an environmental disaster occur which results in a massive plague. An old man isolates himself and his family in his manor to wait out the epidemic. 04/07/1975 0252 The Benjamin Franklin Murder Case Ben Franklin is the hero in this case of an assassination in a Philadelphia mansion in 1750. 07/31/1975 0318 Carmilla In 20th century Austria, a young woman and her widower father are charged with the welfare of a female ward. The two girls grow up like sisters but a terrible secret in the orphan's past threatens to tear their lives asunder. 09/04/1975 0338 The Special Undertaking In order to discover the identity of their new home's invisible resident, a country doctor and his young wife look to an antique music box for clues. 03/24/1976 0454 Brain Drain Questions are raised when a series of deaths of respected scientists are linked to a beautiful and mysterious woman. A police detective uncovers a disturbing plot where a deranged scientist steals their brains to fuel his heinous experiments. Staats Cotsworth (February 17, 1908 – April 9, 1979) was an actor in old-time radio. He is perhaps best known for playing the title role in Casey, Crime Photographer. Cotsworth was once described as "the busiest actor in radio," having performed in 7,500 broadcasts in 12 years. Some of the shows he appeared include Big Sister, Lone Journey, Inspector Thorne, Ma Perkins, Mr. and Mrs. North, Roger Kilgore-Public Defender, The Chase, These Are Our Men, X Minus One, Mr. Keen, Tracer of Lost Persons, The Right to Happiness, Cavalcade of America, Grand Central Station, The Story of Mary Marlin, and Silver Theater. 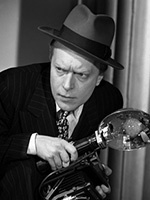 On Television Cotsworth was seen in Killer's Choice, the premiere episode of Kraft Mystery Theatre and in "The Thirty-first of February'", an episode of The Alfred Hitchcock Hour. He was in Macbeth when that play was presented on Hallmark Hall of Fame.